All business decisions come down to numbers, but in smaller businesses, the most important number is cash on hand. Smart business leaders are constantly making compromises to ensure they have the cash they need to operate. So when a small business decides to spend money, it has to be absolutely necessary. It’s understandable then that many businesses allow workers to use their own smartphones to do company work. But at the same time, they are providing those employees with laptops or desktops. It’s time to rethink the assumptions that brought us here. A Bring Your Own Device (BYOD) approach may sound convenient, but there’s a strong argument in favor of buying phones. Given that the average unsubsidized device costs $500 and the average annual salary of a U.S. worker is roughly $50,000, the cost of the device is equivalent to one worker hour per month. That minimal investment in mobility buys a lot. A 2016 Frost & Sullivan report commissioned by Samsung found that smartphone usage increases employee productivity by 34 percent. 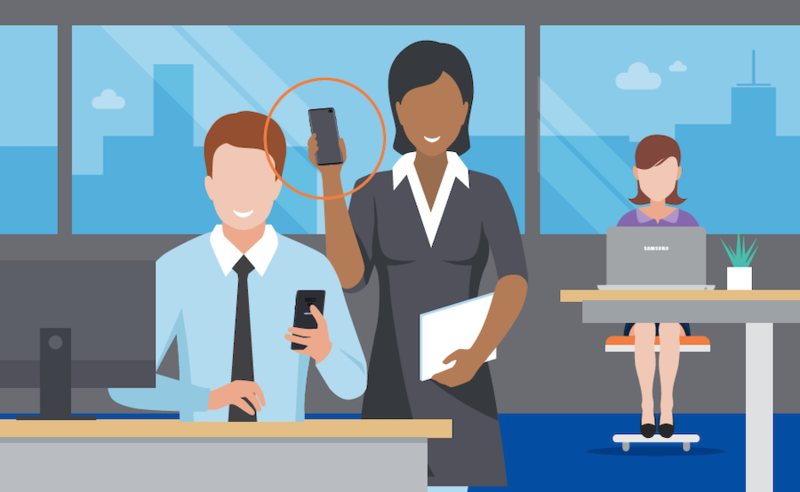 A mobilized workforce is also better prepared to engage with customers because smartphones are versatile, powerful computing devices that can support almost any business application. And as a company shifts its emphasis to mobile on a single platform, IT gains more efficient control over devices and applications. Here are four reasons to buy smartphones for your employees. When employees are already using their own phones for business, it may seem counterintuitive to step in and buy phones for them, but a 2018 Oxford Economics study found that the total cost of ownership for business is $909 per device (inclusive of data charges). The same study found that the average monthly stipend paid to a BYOD user is $36.13, and businesses can incur many more hidden costs in a BYOD environment. When compared to PCs or laptops, which have been found to cost companies $6,685 to $9,595 per year, company-owned smartphones are a bargain. The only instances in the study where BYOD policies yielded meaningful savings were those where the use of mobile devices for work was entirely optional, and involved little more than checking email. If your employees do anything beyond this, you will end up providing inefficient help desk services for the myriad of phones and apps your workforce brings with them. BYOD may not have an initial cost, but time-consuming frustration is a distraction you probably don’t need. The one segment of the workforce where BYOD makes economic sense is hourly workers. Chances are you’ll want to limit their access anyway, and if you were to insist on connecting them, you would likely be liable for the work they did while they were connected. Smartphones are now as powerful as many traditional PCs — and more secure. At this point, almost all computer applications have comparable, if not superior, mobile versions. Many software companies for business (such as Salesforce) even have commercially available development environments, allowing companies to create custom applications. Smartphones are also now fully capable of powering screens and other peripherals to create a traditional desktop environment. Samsung DeX is the most complete rendition of this: The mobile device can connect to a monitor and becomes a computing solution, supporting both mobile and desktop work and avoiding the need to supply laptops. Organizations may also choose to replace their PCs or laptop inventory with mobile devices. Unless being at a desk is absolutely necessary, your workers will appreciate having the ability to work from any location. This alone is likely to cover the cost of your smartphone investment. Mobile operating systems are developed to be managed and secured in ways that traditional operating systems are not. Each app is protected from other apps, and the operating system can be set to shut down or close off access if a compromise is detected. Modern mobile device management (MDM) solutions offer this protection based on changes in context, be it the Wi-Fi security, time of day or location. With the advanced security features built into Samsung Knox, the device and onboard data are protected down to the hardware. Real security requires real management. An employee’s personal device will never be as manageable or secure as one that you manage. BYOD trades security, reliability and manageability for a one-time cost savings. Breaches to privacy or data security can easily cost you your entire business. A number of laws and regulations are converging to complicate the stipend issue and make BYOD less attractive. With corporate-owned and -managed devices, stipends are avoided and you can manage where and when the devices are used. It’s the way of the internet-driven world: When employees own the devices, enforcement is a problem. Some applications have known malicious intent, and with the proper tools in place, you can easily block the devices that are running those apps from connecting to company systems and information. Often those apps are the type of thing you wouldn’t want your employer to know about, creating uncomfortable questions about privacy. When the business owns the devices, you avoid those issues entirely. Providing mobile access to employees is essential in most businesses, and the real choice comes down to either proactively choosing and managing the mobile environment, or herding cats in a BYOD environment. Ninety percent of the time, the smart choice is to buy mobile devices for the employees that need a computing platform and manage it with an MDM to give you visibility, increased security and true privacy.